Rep. Michael McCaul (R., Texas), who chairs the House Committee on Homeland Security, pushed back Thursday against Donald Trump for his friendliness toward Russian President Vladimir Putin. McCaul said Thursday that the idea of Russia being a "friend" to the United States is a "false narrative" when speaking at an event on homeland security hosted by the Atlantic in Washington, D.C., the Hill reported. "I think I would urge caution," McCaul said. "The idea that Russia is somehow a friend of ours, or that Putin is a friend, is a false narrative," the Republican lawmaker said. "They’re not our friends." McCaul’s comments came less than 24 hours after the GOP presidential nominee reiterated his praise for Putin at a national security forum Wednesday evening. Trump has in the past described Putin as a strong leader and indicated that he would work well with the Russian president. "Certainly, in that system, he’s been a leader, far more than our president has been a leader," Trump said of Putin during the "Commander-in-Chief" forum hosted by NBC News on Wednesday night. "We have a divided country." Trump further stated that cooperation with Russia would help defeat the Islamic State in Syria. He also expressed appreciation for positive words that Putin has said about him. "Well, I think when he calls me brilliant, I think I’ll take the compliment, okay?" Trump said. Putin reportedly called Trump "brilliant" and "talented" in conversations with journalists late last year, a comment that he later denied making. "I only said that he was a bright person. Isn’t he bright? He is," Putin told CNN journalist Fareed Zakaria during a panel discussion in St. Petersburg, Russia, in June. Putin also expressed approval for Trump’s willingness "to restore full-fledged Russian-American relations." Some of Trump’s foreign policy positions have appeared favorable toward Russia. During the Republican convention in July, Trump told the the New York Times that he would only come to the defense of a NATO member state invaded by Russia if the country had paid its fair share of defense spending obligations in the alliance. Trump has also indicated that he would consider recognizing Ukraine’s Crimean Peninsula as a Russian territory. The United States and the European Union have refused to recognize Russia’s 2014 annexation of Crimea as legitimate. Trump’s positive statements about Putin have been rebuked by some Republicans. "I hear some people in political conversations today express admiration for Vladimir Putin," Rep. Adam Kinzinger (R., Ill.), who has frankly criticized Trump, said during remarks on the House floor Thursday about the civil war in Syria. "They express admiration for Vladimir Putin’s strength as if oppressing and killing people is something to be proud of. That doesn’t show strength–that shows weakness." McCaul has previously criticized Trump over his national security proposals. 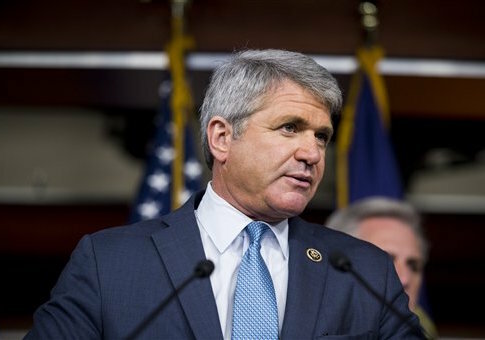 At a June rollout of the GOP national security agenda, McCaul criticized the GOP nominee’s proposal to temporarily ban Muslims from entering the United States. "You can’t ban an entire race or a religion from coming into the country. What you need is a proper vetting system," McCaul said in June. "There are ways to properly vet and protect threats from coming into the United States without just a swath of a ban against any race or religion." This entry was posted in Politics and tagged Donald Trump, MIchael McCaul, Russia, Vladimir Putin. Bookmark the permalink.